Our Country Chronicles: Pink Eye. 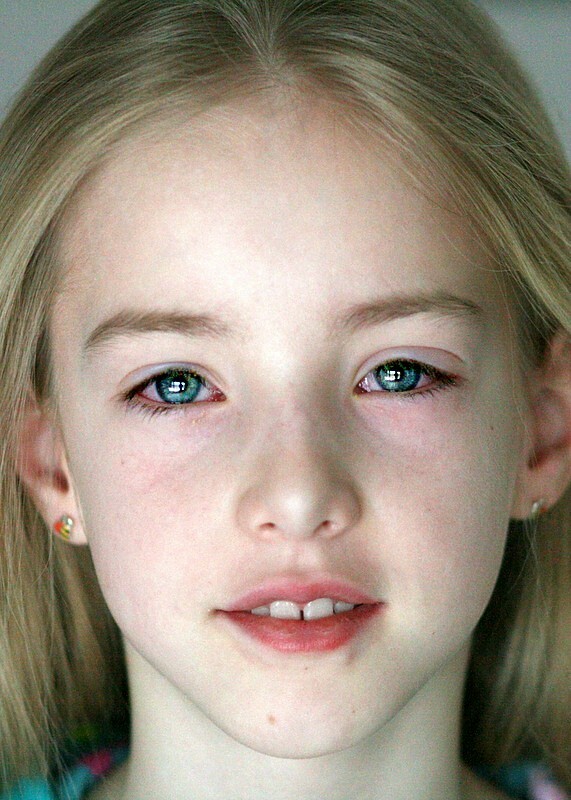 . .
Madeline woke up this morning with both of her eyes crusted shut from pink eye. It took several trips back and forth to the sink to warm a washcloth and gently soften the gunk before she was able to open them. It is so expensive to go to the Doctor. We have a $3,500 out of pocket max that we must meet before we have any coverage. So in a nut shell, we pay "in full" for all doctor visits and prescriptions every year. If something catastrophic were to happen, we'd pay the $3,500 and then the rest would be covered in full. Suffice it to say, I have been using natural remedies for just about everything, and we RARELY visit the doctor. So what to do for pink eye? Head on over to a health/vitamin store and buy this for $14.99. Be sure to ask for an eye dropper for it. Put one drop in each eye 3 times a day. It will clear up over night! Once the symptoms are gone, it's gone. It's an amazing treatment and works WAY better than the over the counter drug store drops or the Vigamox Rx (which costs $45!). I first tried it this earlier in the winter with Madeline. I gave her one does before bed, and by morning, her eye had completely cleared up. I promise you that this treatment WORKS. It does sting however when you put it in the eyes while the infection is present. Once the symptoms are gone however, it does not hurt. Today, she has pink eye in both of her eyes. Even if you only have symptoms in one eye, you must treat both eyes because of the highly contagious nature of the bacteria. Also, lots of hand washing is necessary and don't forget to wash the bedding! This is way better than going to the doctor and far less expensive!! The great thing is, Silver Sol has so MANY other great uses! Click here to see what else it can be utilized for. Because Madeline's eyes were SO bad when I began this treatment, It took a little longer to see results. She stayed home the first and 2nd day of the infection. By the third day, she was symptom free. It really does work. Even on a bad case of pink eye. Absolutely Jessy. Just ask and I'll remind you! I try all natural before I ever result to prescriptions. If you have pink eye, avoid rubbing it with your eyes. Just wash with an antibacterial soap to prevent infection.